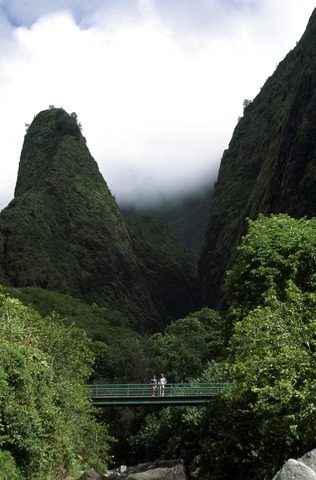 Looking for an easy way to see the beauty of Iao Valley State Park, Maui? The botanical gardens located here will be perfect, especially if a hike through the forest isn't for you! These lush gardens are laced with paved pathways to explore, and plenty of seating areas where you'll be able to sit down and take in the beautiful views! I should mention that the paved walkways and rest areas make this a great stop for anyone who wants to take it slow and avoid overexertion. It's also very suitable for families with children since there's so much to explore and help burn off their energy, and the walkways make it all a breeze! The botanical gardens were tranquil and absolutely magnificent, featuring native Hawaiian plants. You'll also enjoy the scenic lookouts - the most popular one shows off a great view of the famous Iao Needle landmark. Book your rental car for the trip here and save up to 40% on top brands! If you want to check out the Iao Needle from this area, all you have to do is follow a short 0.6 mile path - although you may find some stairs along the way, it won't be too hard for most people. 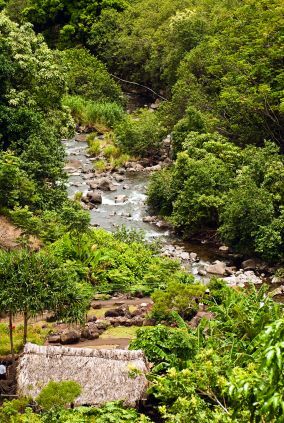 You'll also find some nice views of the Iao Stream as it gurgles past you! Great News for Your Budget! Oh, and I almost forgot to mention that if you're on a budget, exploring these Maui botanical gardens will be ideal! Because it's FREE!! You've gotta love THAT! In late 2016, the park was temporarily closed due to severe flooding. The good news is that according to the state park's website, they think it may be ready to re-open in June 2017. For the latest info on whether or not the park is open, or not, please refer to the state park's website here. These Maui botanical gardens are located up the Iao Valley Road, a little ways past the Hawaii Nature Center. There is lots of free parking available too! 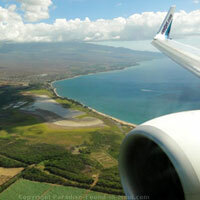 The best way to get there is to head towards Wailuku, using the Honoapiilani Highway. Follow it until you get to Main Street in the town of Wailuku. Make a left turn onto Main Street and when you get to a fork in the road, stay to your right. Main Street just turned into Iao Valley Road. From here on out, it's a piece of cake - just follow the road into the park! Here's a map for the Iao Valley area to give you a better idea of what to expect. Use the "+" and "-" buttons in the bottom left corner to zoom in or out. And by the way, be sure to book your rental car in advance for this. There are limited rental vehicles available on the Valley Isle and if you leave this task to the last minute, they may run out and have nothing available for you. So if you haven't booked your rental car yet, use this link and save up to 40% off top rental car brands including Alamo, Avis, Budget, Hertz, National, & more. If you don't want to drive yourself here, book a guided tour instead. If you don't want to mess around with map and renting a car, then a guided tour is definitely the way to go. Robert's Hawaii is a company that's been around long enough to know what they're doing and treat you right - travelers love them. Their deluxe air-conditioned vehicles will not only take you to see Iao Valley, but other top Maui attractions, too! 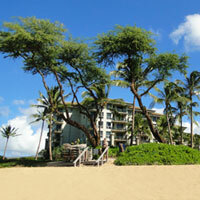 Click here for full details and to book your tour with Robert's Hawaii via my favorite booking site, Tom Barefoot's Tours. 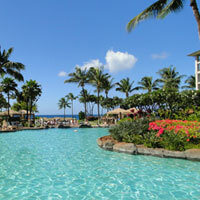 Read more about fun things to do on Maui to relax!